Is it an Indian summer now? It’s certainly sunnier and warmer than I would have expected it to be, seeing how cold and wet September entered. But thanks to the cold at night and a general unwillingness to turn on the central heating any more than we already are (we’re in a bit of denial that summer’s over), I’ve been making a lot of soup. I mean, look, second soup recipe in a row! 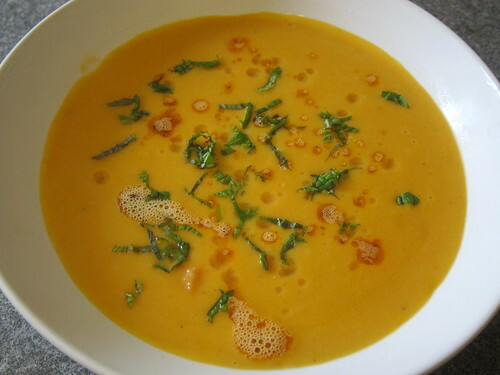 This Turkish red lentil soup, mercimek çorbasi, is currently one of our favourites, it being super easy to put together in very little time. While it’s simmering away (and an extra 10-15 minutes doesn’t hurt), you can go off and do something else. And the flavour! By itself the soup is fine but it’s when you add the lemon and mint that things pick up. And the chilli butter! If you’re looking to keep preparation all down to only one pot, dusting the top of the soup with a little Turkish dried chilli flakes (pul biber) is delicious too. serves 2 as a light meal or 4 as a starter. Heat a medium sized saucepan over medium heat and add the olive oil and onion. Cook until soft and translucent. Add the carrot and stir for another minute. Add the lentils, water/stock, tomato paste and cumin and stir through. Bring to a boil, reduce to a simmer, cover and let simmer until the lentils and carrots are soft – this is usually 20-30 minutes. Blend the soup (I use a handheld blender) until smooth. Salt to taste and dilute too if it’s looking too thick. Keep hot. In a small pan, melt the butter and add about a tsp of dried chilli flakes. Keep over a low-medium heat until the butter turns a beautiful reddish colour. Serve the soup in bowls, drizzled with a little of the chilli butter and topped with fresh mint and serve with lemon wedges. When I found fresh corn cobs at my supermarket recently, I jumped with joy. I love corn! I had a revelatory moment as a child when I first tasted corn kernels smothered in butter – I’m pretty sure I downed that dish, the sweet nubs of corn swimming in butter. Butter. OK, so maybe I fell in love with the butter. But what I’m trying to say very poorly is that corn and dairy tend to go well together brilliantly. And what better way to join them together in holy matrimony than in a soup – in particular, corn chowder. 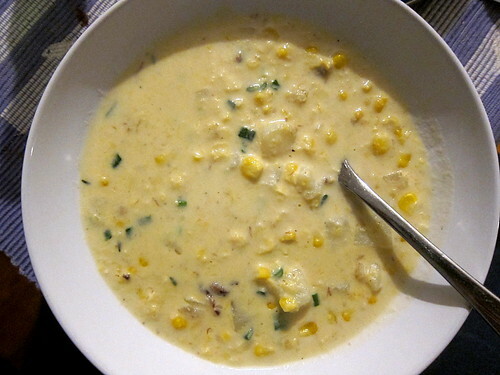 Creamy, creamy corn chowder. This made for a brilliant dinner one cold September night. Serves 2-3 as a light meal. Heat a medium size pot over medium heat and add the olive oil and the chopped onion. Fry until translucent. Add the bacon and fry until cooked. Add the corn, potato, stock and thyme and bring to a boil. Reduce the heat and let simmer for about 10-15 minutes until the potato is soft. Fish out the thyme. Add the single cream and bring back to a simmer. If you’re looking for a slightly smoother texture, go ahead and blend some of the soup; I stuck in a stick blender and gave it a bit of a whiz to give it just a little thickness and body but still with lumps. Add the sliced spring onions and stir through until wilted. Season to taste with salt and plenty of freshly ground black pepper. Serve hot with lots of hot bread on the side. Nuh uh, I don’t have a glut. We only have two courgette plants but together, they pump out enough courgettes to keep us feeling like we’re eating courgettes at every meal. Some days it’ll be a massive one the size of my forearm; other days I’ve got a handful of baby courgettes to use up. But a glut? Nah, surely that’s when you have more courgettes than you can use, right? Because we’re using up all our courgettes so far! And anyway, they are succumbing to powdery mildew now and I’ll make a note that next year, I should stagger the plantings for a longer courgette season! This recipe used up some courgettes and some of our chard as well; the latter is also pumping out leaves at a phenomenal rate! It’s a very versatile recipe – we ate it as it is or let it cool and mix with beaten eggs and turn it into a big omelette. Or even stir it through some pasta. It’s the garden in a pan! Cut the courgettes and in a large sauté pan, cook them in a little olive oil over medium heat, stirring once in a while. Meanwhile, clean your chard and separate stems from leaves. In a small pot of boiling water, blanch the stems and after a couple of minutes, add the leaves. Drain after a minute or two. Add the chard to the courgettes (which should be colouring by now) and stir. Empty the small pot and put back over the heat. Add a little olive oil and toast the pine nuts, pulling them off the heat when they start to colour – the residual heat with continue to toast them. 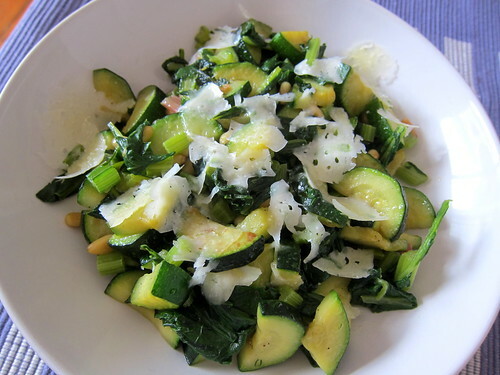 Stir the courgettes and chard together and when all heated through, season. Stir through the pine nuts and plate, scattering the shaved cheese on top. If you follow any of my other social media feeds, you can’t fail to notice that we’ve been consuming a lot of courgettes. Our two plants (one per person, based on advice I read online) having been pumping out the summer squashes and we can’t blink without another flower appearing. So far we haven’t got sick of them; this whole vegetable growing lark is still new and novel to me! This recipe was initially going to be a courgette carbonara but I then thought I’d rather like to chuck in quite a bit of garlic and some chilli too. And I forgot I had some thyme outside and I reckon it would be quite good with that too. Apart from being quite tasty, it had the added benefit of coming together in about 15 minutes, perfect for a weeknight dinner. serves 3 or 2 with leftovers for a lunch. Set of pot of water to boil. Salt it well and set the spaghetti to boil. In a large saute pan, heat some olive oil over medium-low heat and add the minced garlic and chilli flakes. Let sizzle gently for a minute – you don’t want it to colour. Meanwhile, trim and grate the courgettes and then add all the gratings to the pan. Turn up the heat to medium and cook, stirring often. In a bowl, beat together the eggs and pecorino with salt and lots of black pepper. By the time the spaghetti has finished cooking, the courgette should be done. Turn off the heat for the courgettes in the sauté pan and add the drained spaghetti. Working quickly, pour over the eggs and then mix altogether well to get a creamy sauce. Serve. The idea of using parathas instead of tortillas to make tacos came via a restaurant I passed while wandering around New York City. The place was called Goa Taco and the name was intriguing enough for me to note it down in my phone; however, it was only a couple weeks ago that I went through said notes and finally looked up their website. 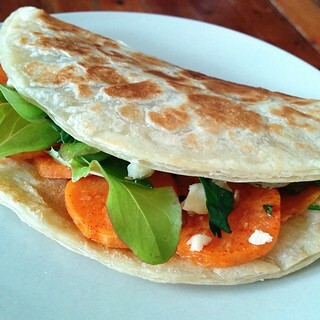 Yeah, there were tacos, but their shells were using flaky Indian flatbreads – parathas. Their fillings weren’t limited to Indian or Mexican ones either; anything went, really! My thoughts turned to this idea on the weekend, when I needed to come up with some kind of brunch with what we had in our cupboards and fridge. It turns out sweet potatoes keep very well in my cupboards. While onions and regular potatoes tend to sprout faster than I can cook with them, the sweet potatoes are still firm and delicious; I now keep a few in my cupboards for days like this. And we always keep a packet of frozen parathas in the freezer. Oh yes, and that bottle of salsa verde (the Mexican kind made with tomatillos) needed using up. Yes, we had brunch! Fry the sweet potato slices with a little oil in a frying pan with a little heat. They should be soft in just a few minutes – let them colour a little. When they come out of the pan, dust them with a little salt and smoked paprika. In the same pan, cook the roti paratha according to package instructions. When they’re cooked, fold them in half and distribute the sweet potatoes between them. Dollop on the salsa verde and chuck in some salad leaves, grated cheese, toasted seeds and fresh coriander. Devour. This was easy to put together last weekend thanks to the Taiwanese sandwich buns that are sold frozen in many Chinese shops. I bought mine at my local Wing Yip and I’ve found them online (for local delivery only) at Bristol’s Wai Yee Hong. They look petite when frozen but after their session in the streamer, they puff up and you quickly adjust your number of buns per person. I filled mine with a very simple braised pork mixture that tastes fantastic in spite of its simplicity. It’s a bung it all into a pot and leave it deal. And I like to think that as I’m using pork shoulder instead of the usual fattier pork belly but really, that’s just me being a bit deluded. The work is really minimal and you’re rewarded with big puffy sandwiches filled with juicy meat. Cut the pork shoulder into large chunks, trimming off the fat and skin. Heat a large pot over medium-high heat and add a little sunflower oil. Add the pork shoulder and brown on all sides. Cover with water and add the soy sauces, garlic cloves, star anise and five spice powder. Bring to a boil and then reduce the heat to a simmer, cover and cook for about 1 hour. Skim if necessary. After an hour is up, add the daikon, adding more water if required and continue simmering for another hour. At this point, the daikon should be tender and the pork chunks falling apart at the prod of a fork. Now to put together the sandwiches! Prepare the buns (my package said to steam for 15-20 minutes). Take a small handful of roasted peanuts and chop finely and mix with sugar. Chop some pickled mustard greens as well. Get some crispy fried shallots/onions. Clean a few sprigs of coriander. Take a few pieces of braised pork and shred them using two forks, pulling the meat apart. 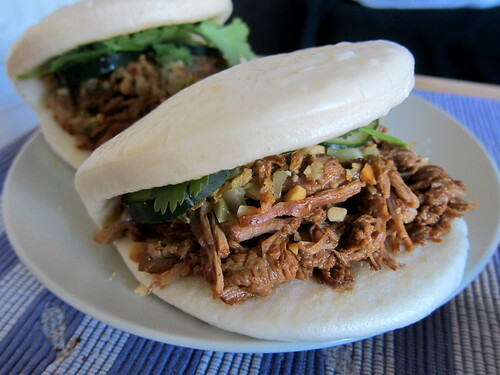 Pile generously into the steamed buns. Add a slice of daikon if you wish. Top with some of the chopped pickles, peanuts, fried shallots and coriander. Eat. Spaghetti carbonara has to be one of the best store cupboard pasta dishes that one can whip up in the time it takes for the spaghetti to boil. We’ve only just discovered that the addition of something green is absolutely brilliant as it helps cut the richness a little and you certainly feel better about getting your greens in even with such a quick meal. While I’ve seen recipes for courgette carbonara, we like the addition of broccoli. Broccoli keeps for ages in our fridge and well, I just feel courgette can be a bit boring at times. 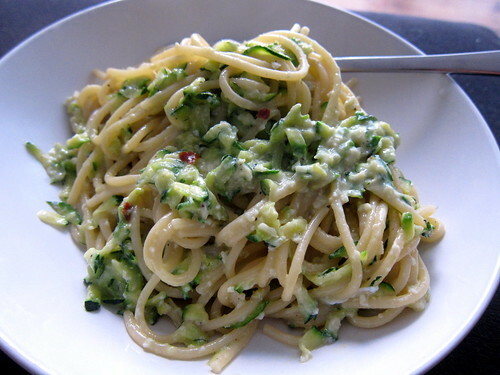 Adding the broccoli doesn’t add any time to the preparation of the pasta dish as it’s cooked with the pasta. And, of course, as my Italian colleagues are likely to shout at you – no cream! The egg and cheese and pasta water will make it all creamy by itself. Set a large pot of salted water to boil and get your pasta cooking. Crack all your eggs into a bowl and beat them well. Add the grated pecorino romano and season with salt and lots of black pepper and beat well again. Heat a large saute pan and add a little olive oil. Chop the bacon/pancetta and fry off the pieces slowly. Keep on a low heat when ready. Chop all the broccoli (the stem too) into small pieces and toss them into the pasta water when the pasta is almost done. 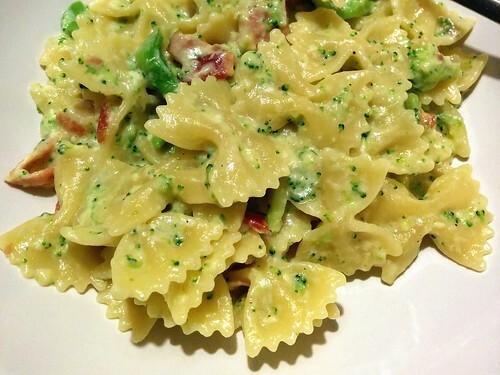 When the pasta is ready, the broccoli will be too – drain them both and add to the warm pan with the bacon. Stir and while stirring, pour over the egg mixture, and keep mixing all together. The egg and cheese should coat the pasta without scrambling. If it’s looking a bit too dry, add some of the pasta cooking water. Serve immediately.